The Pebble Beach Concours d’Elegance is always a great place to get a first glimpse at the car companies’ dream machines. Yes, you heard it correctly. 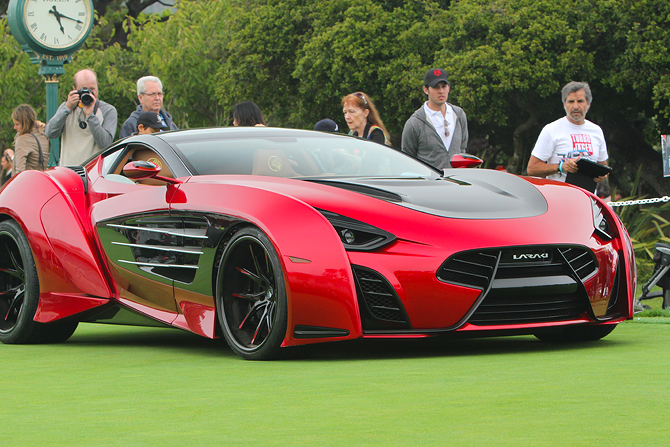 Although the Pebble Beach Concours is the most famous car show for classic cars and exotics, it’s also home to the Concept Cars lawn. The Alfa Romeo Disco Volante by Touring is a bespoke offering from Touring that will be limited to eight hand built vehicles. The Touring Superleggera is inspired by the Touring-designed Alfa Romeo C52 of 1952. Subsequent Alfa sports cars in later decades after that initial C52 earned the nickname of “Disco Volante” (which translates to Flying Saucer in English). The eight bespoke Disco Volantes will sport a mid-front 4.7-liter, 450-horsepower V-8 mill that’s mated to a sequential paddle-shift rear transaxle gearbox for optimum front-to-rear weight balance. Independent front and rear suspension and a limited-slip differential will enable the eight hand-built Touring Superleggera Alfa Romeo Disco Volantes to go very fast around the twisty roads, in addition to the straights. 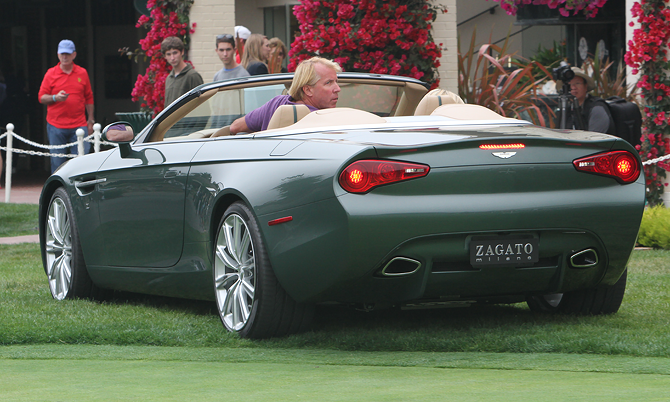 Mind you, we say it’s a lawn, yet it’s really the Pebble Beach Golf Club’s putting green. 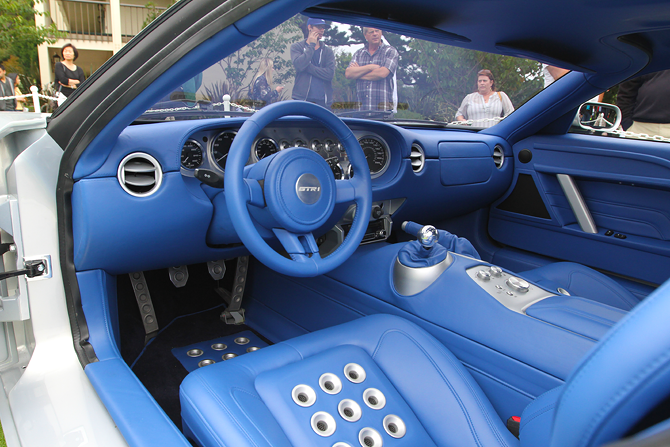 We can’t imagine a better venue to appreciate new show cars that might be making it to production one day than at the venerable Pebble Beach Concours d’Elegance. What a juxtaposition we have at Pebble. On the one hand automotive enthusiasts can lust over priceless Duesenbergs, perhaps a rare German Auto Union Wanderer W25K roadster, Auburn 851SC Boattail Speedsters, Bugatti vintage sports cars, Alfa Romeo Grand Prix racecars, and indeed every manner of rare and vintage machines that go up in value almost everyday. 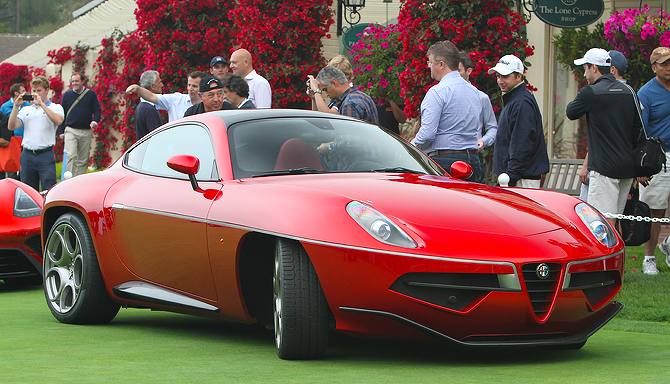 While at the other end of the spectrum, one can imagine that if we are imminently fortunate, we might one day be able to purchase the concept cars that adorn that famous putting green in Pebble Beach. Lest you think the putting green is only famous because it’s part of one of the greatest golf course’s in the world, you’d also be incorrect. 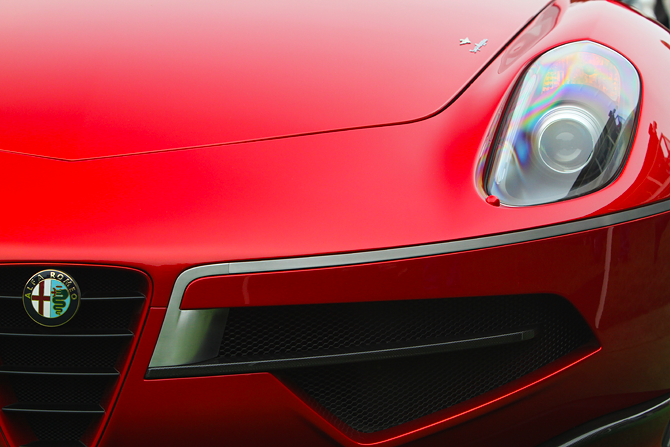 On the final Sunday of Monterey Car Week at the Pebble Beach Golf Course, the greatest automotive show on earth is the Pebble Beach Concours. 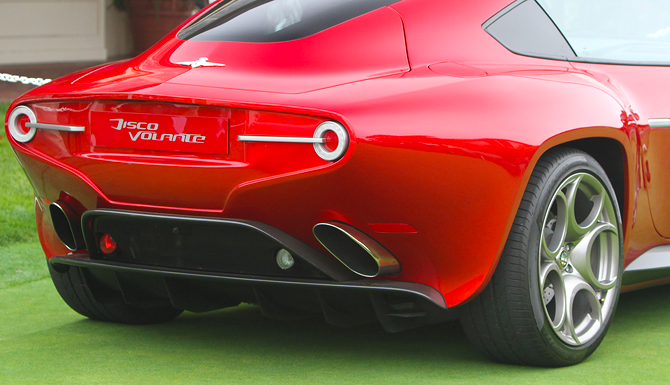 That putting green is at least partially famous for being the annual one day home to some of the most amazing Concept Cars that have ever come from every great automotive company in the world. Since we’re only concerned with the dream machines that are from Europe on Autobahn Buzz, let’s focus in on the vehicles that most captivated our attention. We hope to see you on the putting green and on the fairway when the 2014 edition of the PB Concours d’Elegance takes place. But if you can’t make it, rest assured that Autobahn Buzz will give you the scoop. Enjoy and dream big! There is a full feature article on Autobahn Buzz concerning the 2014 Jaguar Project 7 concept car that includes a scintillating video of this beauteous beast attacking the Goodwood Speed Festival Hill Climb course. 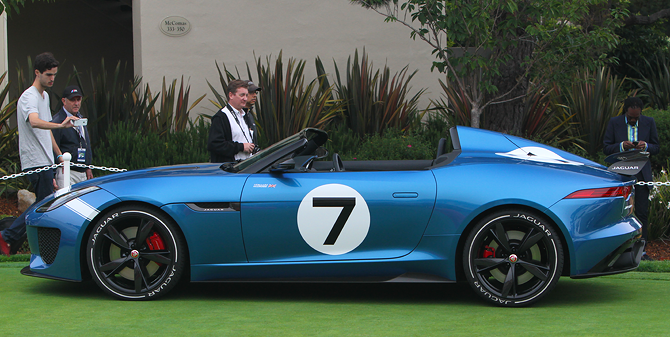 Check it out for all the details on the Jaguar Project 7. 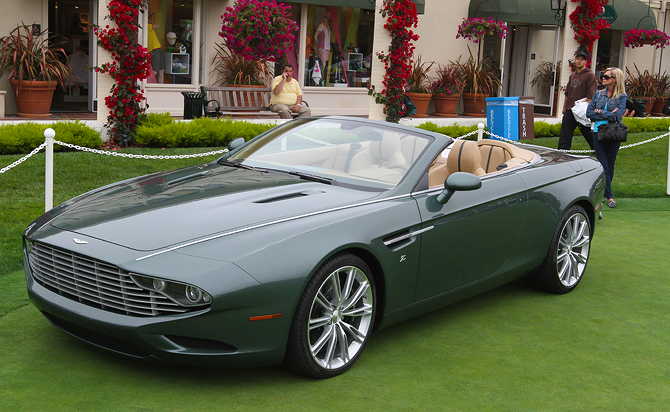 Inspired by the Aston Martin DB7 Zagato, the Aston Martin DB9 Spider Centennial is a one-off concept car that also pays homage to the DB7 Zagato. 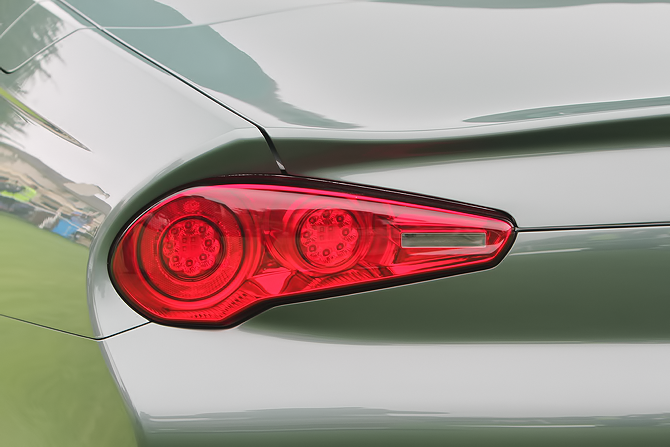 We think it also evokes the Ford Thunderbird convertibles of the mid-1960s especially with the front grille. The DB9 Centennial made its world premiere at the company’s 100th Birthday Bash at Kensington Gardens in Jolly Great Britain. Powering the one-off bespoke DB9 Centennial Zagato convertible is a V12 Aston Martin Vanquish powerplant that produces 517-horsepower and 620 Newton Meters of torque. The cockpit of the Centennial is every bit as luxurious as it is sporting and sumptuous. 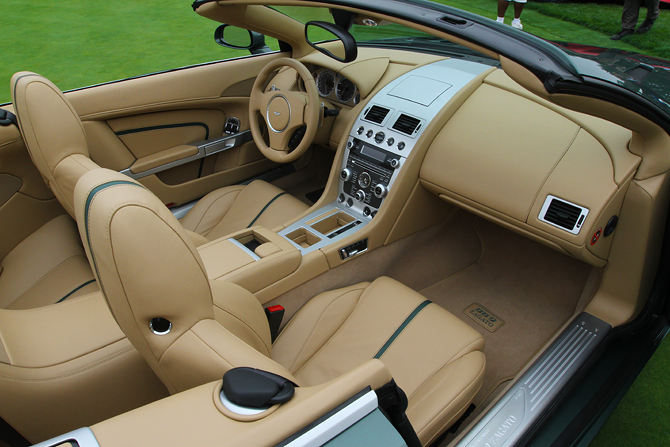 Owning a one-off Aston Martin V12 2+2 convertible is our idea of cruising the German Autobahn or any boulevard in style. Though the three-off Lamborghini Veneno is a racing prototype for the road, it looks more like a stealth fighter jet with four wheels. The v12 mill produces a most prodigious 750-horsepower and propels the Veneno from naught to 60 miles per hour in 2.8 seconds and reputedly has a top speed of 220 miles per hour. 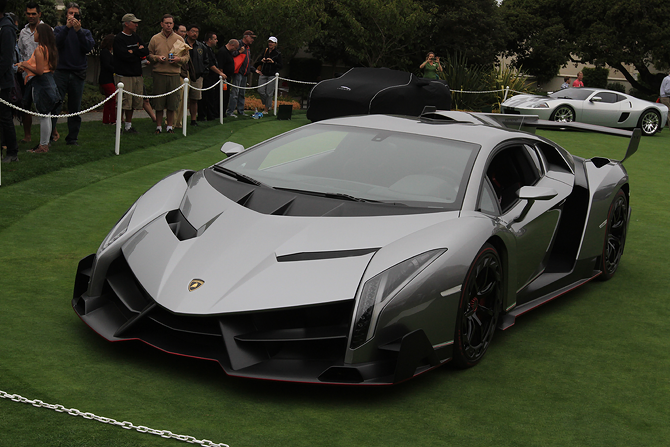 Considering how the Veneno appears in person, we’d guess that the reported top speed is low. It’s more like a Mach1 sort of fighter jet air attack speed to us. 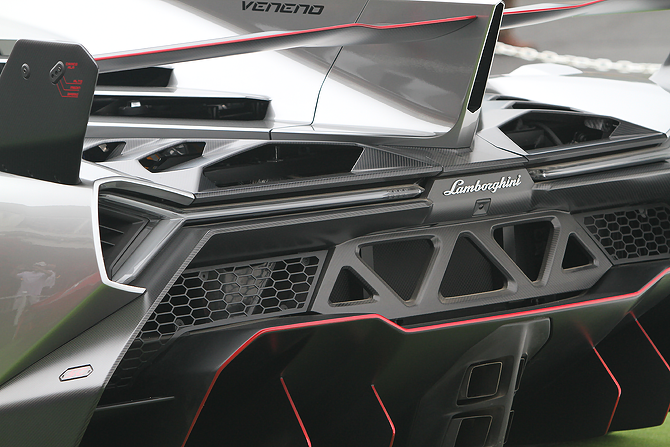 Please remember that you can read all about the Lamborghini Veneno in a separate article on Autobahn Buzz. We admit it; California is quite a ways from Europe. This mid-front engine hypercar looks like it could have emanated from several European design houses or maybe Asia, yet it originates from where many vintage, exotic, muscle and new supercars reside. So, permit us a little laid-back California latitude by including the Epitome on Autobahn Buzz. A 7-liter, quad turbo V-8 delivers 1,100-horsepower to the rear wheels, which is quite sufficient to get the muscular and wild Epitome down the road quite quickly. 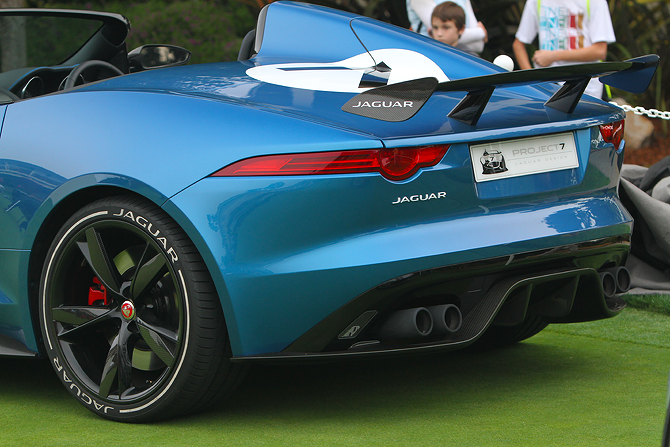 Did we mention that it weighs just 1,400-kilograms? 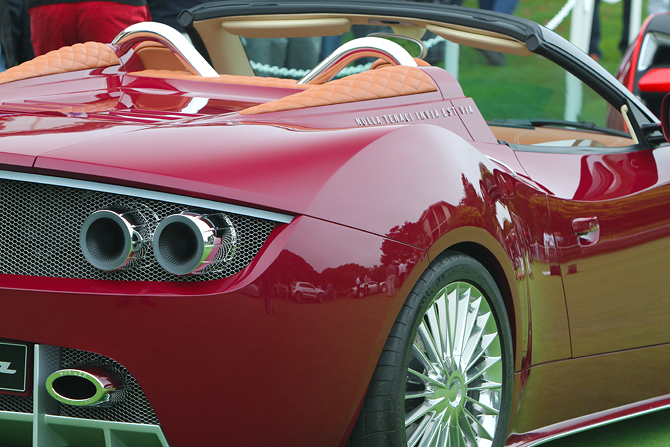 Production of the V6 mid-engine Spyker B6 Venator will begin in the latter part of 2014. The Venator Spyder will initially be distributed in the Middle East, United States, Europe and Asia Pacific. 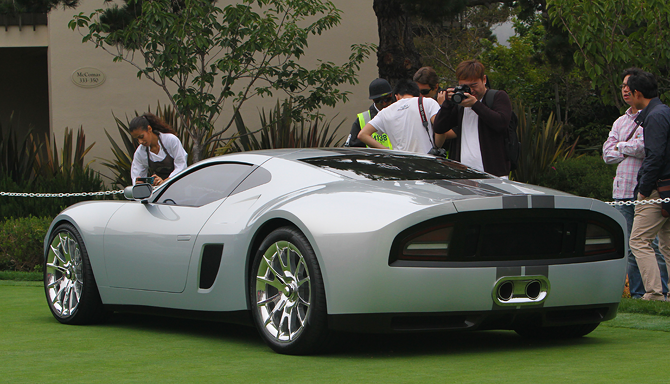 Permit us once again to report on a supercar that was created in California and not Europe. In this case, it’s warranted, since the original Ford GT40 four-consecutive-time 24 Hours of Le Mans winning racecars of 1966 through 1969 were created from an international team of designers and engineers that Ford hired, led by Eric Broadley of Lola Racecars in England. Galpin Auto Sports has been customizing vehicles for 60 years, and this GTR1 is Galpin’s first coachbuilt supercar.The all-aluminum Galpin Auto Sports designed body is handcrafted by Metalcrafters and is five inches wider than the Ford GT that came out in 2005. 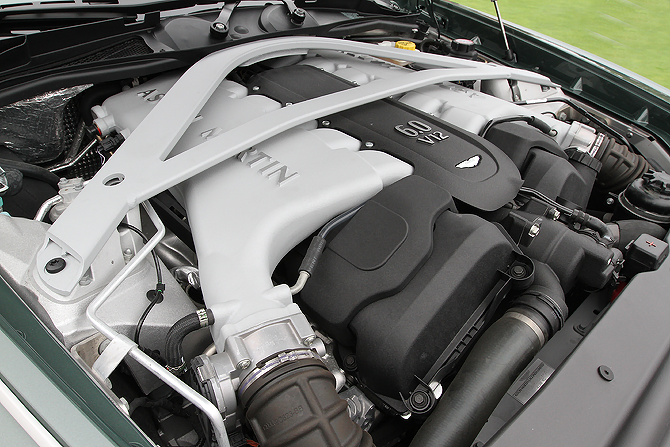 A twin turbocharged 5.4-liter V-8 engine will generate an estimated 739 lb-ft of torque and a whopping 1,024 horsepower. Of course, these Galpin Ford GTR1’s will be produced in very limited numbers and may be constructed with aluminum or carbon fiber bodies, according to the owner’s wishes. We know that you’ve enjoyed seeing these 2014 German Autobahn worthy concept cars, supercars and hypercars. There were even more vehicles worthy of mention. But, what we really encourage all of you to do is to make a trip out to Monterey and Pebble Beach for the greatest car events on earth for 2014 in the middle of August during Monterey Car Week. We hope to see you there!